Today's comic features a rare re-appearance from X and Y's predecessors, Mr. Blank and Mr. Black! (And also a younger X and Y.) Those of you who are unfamiliar with them... maybe now is the time to take the plunge and read the Noosehead arc! It's not required, but I bet you'll probably like it! 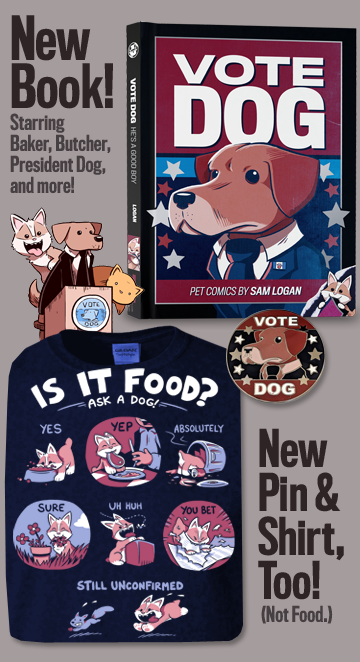 We return on Friday, with a new comic and a new round of Q and A! See you then, team. A new comic arrives! And as it does, Shannon and I are completing our trek home from our summer vacation. So enjoy your series of words and panels. A new one arrives on Wednesday! 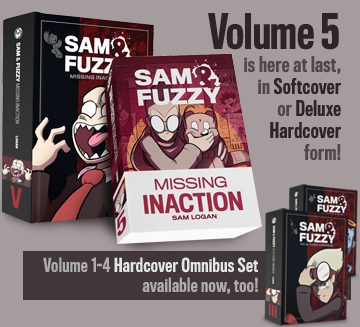 If you haven't read it before -- or if you'd just like a refresher -- the Paxton Towers job was chronciled back in the Big Cheat flashback chapter of Sam and Fuzzy Fix Your Problem. It features a cameo from a fan-favourite (and now deceased) S&F character, and one gratiutous use of pop music. We return on Monday with our next strip. See you then!